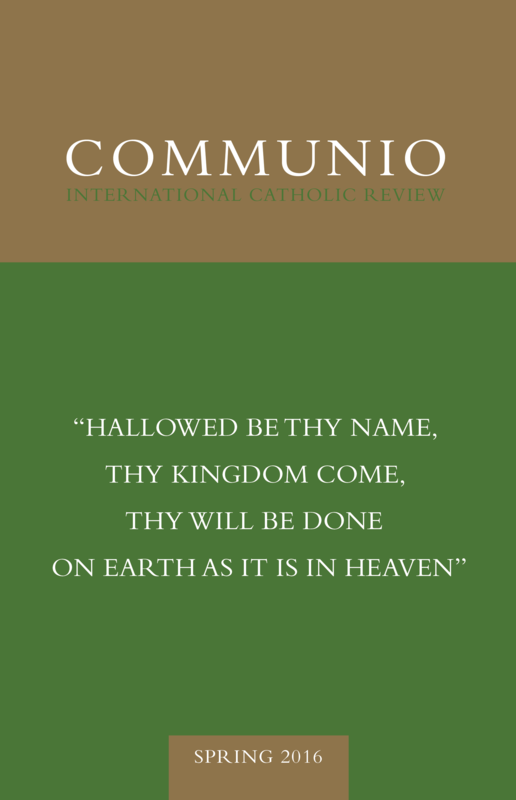 The Spring 2016 issue of Communio is the second installment in our series dedicated to reflection on the prayer that Jesus taught us. “Hallowed be thy name, thy kingdom come, thy will be done on earth as it is in heaven”: these three petitions point to the original rapport between God’s will and the innate aspirations of created freedom. This very rapport between God and the world is epitomized by Christ’s divinely-human prayer to his Father, in which he invites his Church to share. Holger Zaborowski, in “‘Hallowed Be Thy Name’: Of God and Men and the Miracle of Language,” ponders the theological foundations of language through its encapsulation in the personal name. The name, Zaborowski argues, reflects the sacred dignity of the human person, who has been given being by God for the sake of a unique mission in the world, and who always stands within God’s intimate and encompassing address. “That men have proper names . . . can therefore be understood, in the end, only if there is this God, who is concerned about man, a God who calls man into life, calls him, cares for him, and worries about him.” Zaborowski concludes that it is only the recollection, invocation, and glorification of God’s name that ultimately preserves sensitivity for the mystery of human persons and, consequently, upholds the coherence of human speech. D. C. Schindler attempts to shed light on the reconciliation of heaven and earth from the perspective of the task of the philosopher in “‘Unless You Become a Philosopher . . . ’: On God, Being, and Reason’s Role in Faith.” Schindler argues that faith in God’s self-revelation demands an inquiry into being and into the nature of reality simply. “Our faith, precisely because it is a faith in the God who, as First Cause, brought all things into being, opens up the entire world to our minds, and draws us intellectually into that world with a vital interest.” Metaphysics rests on the affirmation of God’s generosity both in giving creation to itself and in giving himself in the creation that he lets be, and thereby safeguards the intelligibility of God’s superabundant self-gift in the Incarnation. In turn, Christian revelation does not in any way eclipse, but only further justifies, the philosopher’s fidelity to being. José Granados, in “The Synergy of Doctrine and Life,” rejects the view that doctrine is a “lofty ideal” or mere “general rule” juxtaposed to living praxis. He contends rather that the body of the Church’s teaching, like the sacramental liturgy, flows and cannot be separated from Jesus’ life in the flesh. In turn, doctrine offers the standard for the Christian’s concrete way of life, itself a participation in the humanity of the Son through the Spirit. Since it animates Christian action and is in no way foreign to it, doctrine is what preserves the Church’s freedom to receive the Father’s kingdom in her life on earth. We close the issue with a 1957 essay by Albert Béguin on the French poet Charles Péguy, entitled “Péguy and the Communion of Saints.” At the center of his reflections on the Christian mysteries, Péguy found and celebrated the reconciliation of the eternal and the temporal, the spiritual and the carnal, the heavenly and the earthly that is contained in Jesus’ prayer. Béguin attends to how Péguy saw this reconciliation expressed in the fidelity of the saints—and Mary above all—who belong at once wholly to God and wholly to the world. The editors and the staff of Communio extend their gratitude to Rachel M. Coleman for her many years of thoughtful and efficient work managing manuscripts, organizing the office, and attending international meetings. We wish her well as she begins teaching and finishes her dissertation, and are grateful that she will continue to help us from afar as an editorial assistant.